Before the pin bar and inside bar, there are many doji patterns that are considered as the most frequent and easily recognizable candle formations. Although not as popular as the pin bar strategy, but the method of trading with doji is actually no less useful. In fact, relying on a doji can be more profitable for novice traders because the formation is easier to recognize. 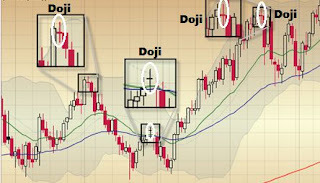 Although this doji formation is said to appear often, it does not mean that the appearance does not mean anything. Adherents of candlesticks must know if each part of the candle and its various patterns can be used to read market conditions. With its "unique" appearance, the doji is able to recount the market conditions that are being consolidated. Characteristics of a doji that has a very small body candle is certainly not without cause. The pattern is formed because prices open and close at very close or even the same level. This situation is considered a sign of bullish and bearish sentiment in a balanced state. But unfortunately, it has been explained that the doji only shows market consolidation. There is no definite clue whether the possibility of reversal or forwarding can be identified from the doji candlestick. Sometimes, traders are advised to wait until there is a further candle to confirm the doji signal. This could be one reason why pin bars are more popular than doji. With a candle shape that is almost the same, the pin bar is more distinguishable to be bullish and bearish pin bar to estimate the next price direction. Meanwhile, the appearance of a doji tends not to be able to give a definite signal regarding the possibility of further price movements. Apart from these shortcomings, doji can still be used as a reliable price action analysis tool. In fact, this candle pattern can also be used to complement the binary options trading strategy, especially the method that focuses on the reversal opportunity search. Candle size is a major component in determining the validity of the doji as a signal of reversal. The smaller the body doji and the longer the shadow, the better the indication. If the candle axis is not how long, it could be that it is not a doji, but a spinning top pattern that merely indicates unclear market conditions. Basically, the doji formation is divided into 4 parts: Long legged, gravestone, dragonfly, and doji star. It appears that gravestone and dragonfly significantly only have a long shadow on one side of the candle. These two formations can specifically mark opportunities for reversal more clearly. Dragonfly doji is marked by a small but lower shadow long candle, and identifies the possibility of a reversal from the uptrend to the downtrend, especially if it appears at the top of the uptrend. Conversely, gravestone with a long upper shadow is a sign of a bullish reversal that can be relied upon when it appears in the bottom downtrend. In this case, dragonfly and gravestone have functions similar to hanging man and hammer patterns which are also often considered by users of trading reversal strategies. The stronger the price trend formed before the doji, the more likely the reversal will occur. Observe whether the previous price has moved in a clear uptrend or downtrend. You can take advantage of trend indicators such as trendlines, or trend force gauges like ADX to make sure. Price movements at important levels are often translated as crucial moments to take steps. Likewise with the appearance of doji formations. If you find a doji candle that is formed near psychological levels, reversal support, or overbought and oversold, then that could be an important indication to take immediate action. The key level that is most often used to ensure the doji signal is support and resistance. Doji around the support is likely to be the start of a bullish reversal, while if it is formed at the resistance level, it can be interpreted as an indication for a bearish reversal. On the USD / JPY chart above, the doji appears to have formed after the price trend rose significantly. The candle formation appears as a gravestone doji with a small body and a long shadow that signals a bearish reversal. Another more convincing indication of potential price reversals is the formation of a gravestone doji candle at the resistance level. These confirmations are inevitably a reliable signal to place the "put" option after the doji candle has finished forming. As a closing step, you can specify expiry time based on the time frame. Binaryoptions.net gives input to consider 2-5 candles after the doji to place the exit position. That means, if you play on the H4 chart like the example above, then you can choose expiry between 8 hours to 1 day.